As people are gaining needs for consumer goods and on-line shopping, flexible and smart manufacturing has become an essential part while running a business. Due to the rise of IoT and M2M, more and more companies are applying higher level of automation into factories. It has the advantage of reducing cost and time and can also accelerates efficiency. Korenix Technology has developed six main product lines which includes Industrial Ethernet Switch, Industrial PoE Switch, Industrial Wireless & Cellular Solution, Industrial Media Converter, etc. 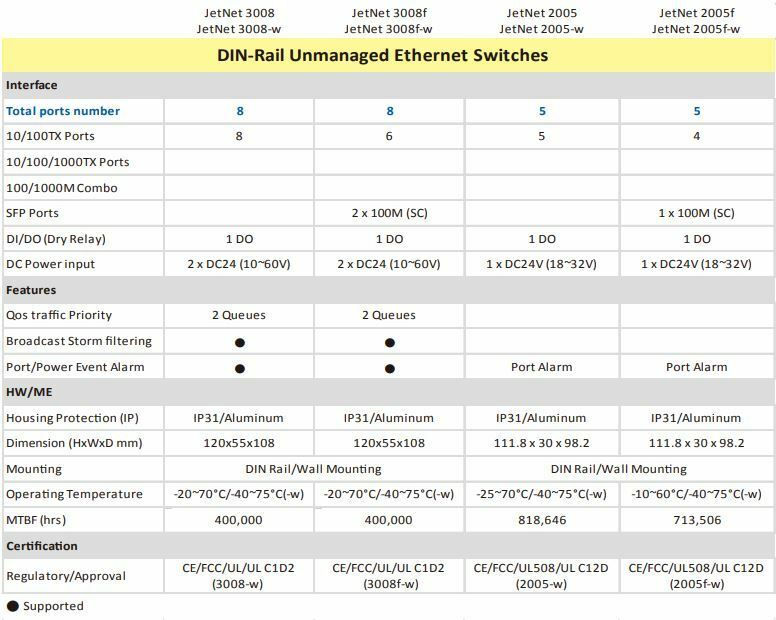 Within all the product lines, the Din-Rail Unmanaged Switch series is highly appreciated by the customers because it is easy to use and cost effective. Taking its advantages, more and more factories choose to apply unmanaged switch for their first and effective steps of Factory Automation Applications. Korenix provides compact size Industrial Din-Rail Unmanaged Ethernet Switches from 5 ports to 18 ports, Fast Ethernet Fiber to Gigabit, etc. The users with the requirement of more ports can choose to apply Korenix JetNet 3018GIndustrial 16+2G Gigabit Ethernet Switch for its Automation and related cases. On the other hand, if the case requires fewer ports, JetNet 2005/2005-w Industrial 5-port Compact Fast Ethernet Switch and JetNet 3005G Industrial 5-port Full Gigabit Ethernet switch may be the best fits. Moreover, JetNet 3008G is another popular choice among the customers. It ensures high switching performance and easy installation which is an ideal solution for the most bandwidth demanding applications such as IP surveillance. 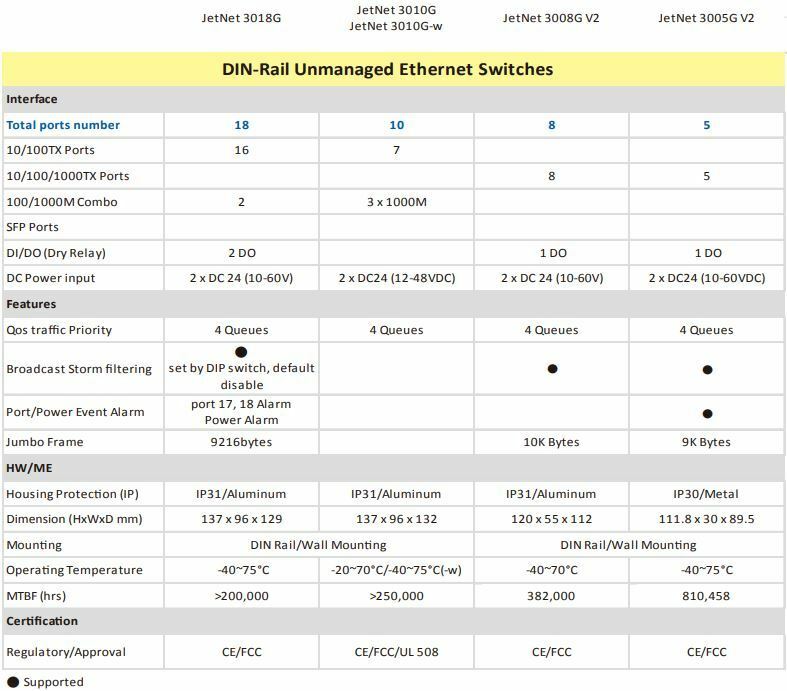 Korenix Din-Rail unmanaged switch series are easy to configure and cost- effective. As the quantity and complexity of goods are increasing, an easy to manage and flexible factory is also gaining importance for manufacturers. With Korenix Din-rail unmanaged switches, users no longer have to worry about complex setting processes, and can easily make devices work by simply power them on.